A rumor on Friday claims Nike is planning to shut down the division responsible for creating wearable fitness trackers, starting with the axing of as many as 55 people from the FuelBand team. Citing people familiar with the situation, CNET reports Nike is looking to quickly spin down its Digital Sport division, which is responsible for products like the FuelBand SE, Nike+ sportwatch and other connected devices. According to the source, Nike notified the division's 70-person hardware team of the decision on Thursday, ultimately firing 70 to 80 percent of the group, or up to 55 people. A number of those let go may potentially take on positions in other Nike offices, though details are unknown at this time. Nike has yet to confirm the supposed job cuts . "As a fast-paced, global business we continually align resources with business priorities," said Nike spokesman Brian Strong. "As our Digital Sport priorities evolve, we expect to make changes within the team, and there will be a small number of layoffs. We do not comment on individual employment matters." In a more questionable post on anonymous social network Secret last week, one supposed team member said, "The douchebag execs at Nike are going to lay off a bunch of the eng team who developed the FuelBand, and other Nike+ stuff. Mostly because the execs committed gross negligence, wasted tons of money, and didn't know what they were doing." The hardware team accounted for less than half of Nike's Digital Sport arm, which employs some 200 people. Interestingly, the software team, called Nike Digital Tech, will not be affected by the reported rejiggering, leading some to speculate that the company is planning to provide Apple with backbone software for its much-rumored iWatch device. Nike last week announced a new research and development entity in San Francisco called Fuel Lab, which will concentrate on building out products leveraging the NikeFuel workout metric. Circumstantial evidence supports such a partnership, but proof of a deal is far from concrete. Apple CEO Tim Cook has been on Nike's board for nine years, which likely played a role in the brand's ability to stay on the cutting edge of fitness software incorporated into Apple products. Nike+, for example, has been part of Apple's ecosystem since the Nike+iPod sensor kit was released in 2006. Most recently, when the latest iPhone 5s was revealed, a specialized Nike+ Move app was shown off during a demo of the handset's dedicated M7 motion coprocessor. Update: In a statement to Re/code, Nike confirmed a "small number" of people within its digital division were let go, but refuted CNET's report that it is closing the team's hardware arm. 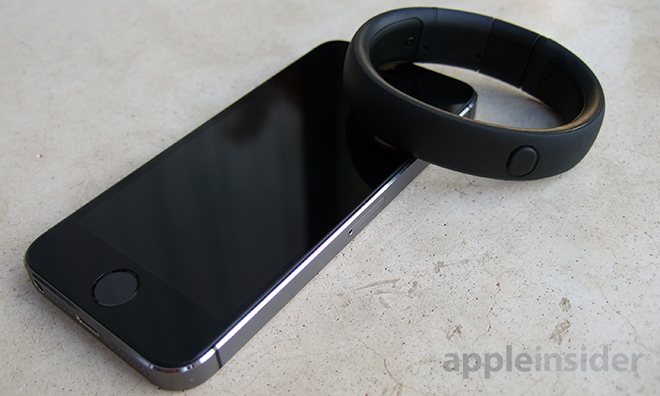 "The Nike+ FuelBand SE remains an important part of our business. We will continue to improve the Nike+ FuelBand App, launch new METALUXE colors, and we will sell and support the Nike+ FuelBand SE for the foreseeable future."